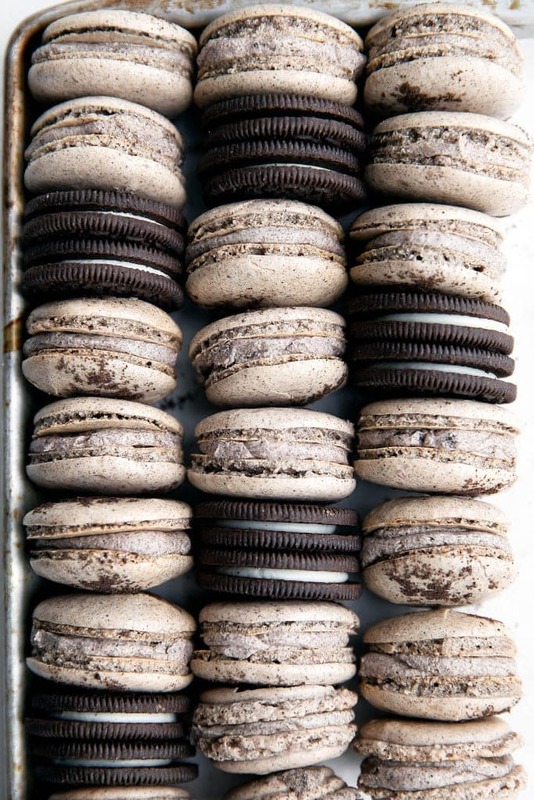 Disclaimer: I am currently eating one of these cookies and cream macarons as I type this. By the time this post is over, I will have eaten four. My hands will be sticky and my keyboard covered in crumbs, but it will have been worth it. As the story goes, one little baker wanted to make macarons, but was too scared to try. She didn’t have a scale to measure her ingredients, and she had tried making macarons in the past and completely failed. It was at Christmas time and she wanted to make eggnog macarons. But they came out of the oven looking more like pancakes than macarons. Feeling hesitant, she found a new recipe online for macarons. But the ratio of eggs to sugar was low, and it ended up a very crumbly macaron. She tried again using the same recipe, thinking maybe it was something she did in the baking process. Nope, the macaron was too airy and crisp. So this little baker decided to try something else. She created her own recipe, and to her surprise, the macarons came out parfait. She was so excited that she did a little dance in her kitchen, and proceeded to squeal intermittently during the photoshoot of said macarons because she was so happy. And on that note, I’m very pleased to share some exciting news with you guys: I’m officially a Rodelle Brand Ambassador! For those of you that don’t know, Rodelle is a fantastic company that makes high-quality baking ingredients, extracts, and spice blends. It began in 1936 when the Rodelle family immigrated from France to the USA. Noticing a lack of quality vanilla extracts, this baking family decided to come up with their own, and Rodelle was born. Now you can find Rodelle products around the country and all over the world, from their line of vanilla extracts to their dutch cocoa (I’ve baked with it four times in the last three weeks. It’s incredible!). Not only do they have high quality ingredients, but they also have a strong commitment to both social and sustainability issues. Their facility is wind-powered, they work directly with farming cooperatives, and they pay premium prices to their farmers. If you know me, you know how much I care about good business practices, especially when it comes to food. It’s companies like Rodelle that the world needs more of, and I’m so excited—and so proud—to be a tiny part of it. And did I mention that the ingredients are AMAZING? 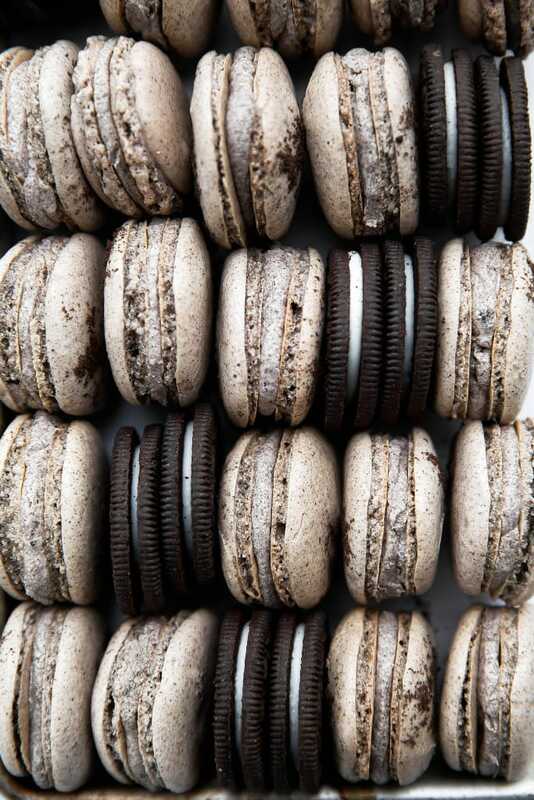 For example, I made two batches of these cookies and cream macarons. One was with no extracts, and the other used their chocolate extract in the macaron, and vanilla in the cream. The flavor difference was beyond noticeable. 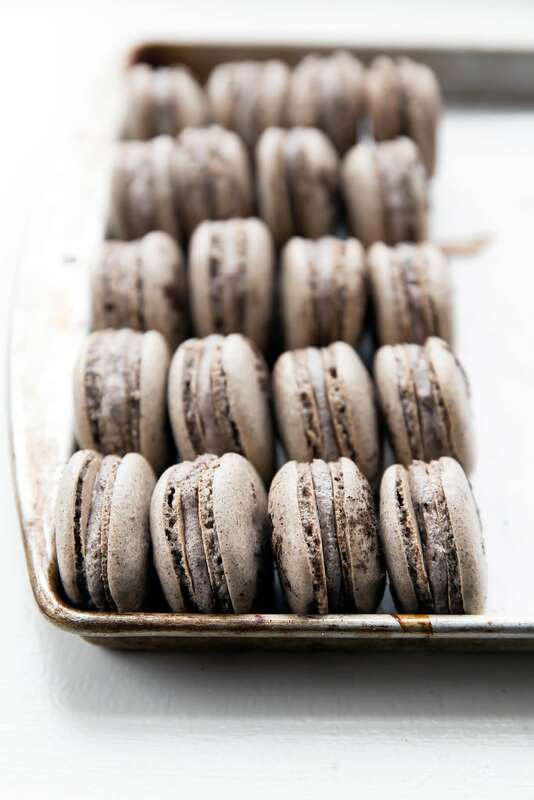 The extracts gave a depth of flavor to the macarons that took them over the edge. The macaron itself had a richer, deeper chocolate flavor, and the buttercream tasted, well, creamy! So next time you’re looking for an extract (or other baking ingredient!) at the grocery store, I encourage you to reach for Rodelle. Your tastebuds will thank you! Use almond flour, not almond meal—Almond flour is much more finely ground than almond meal and doesn’t contain any of the almond skins. Almond flour makes for a better macaron and keeps the cookies chewy and light in texture. Whip the egg whites until soft peaks form—These cookies and cream macarons use no leavening agents besides whipped egg whites, so it’s doubly important that you take the time to properly whip them up. You’re looking for soft peaks in the egg whites, which will take a few minutes of whipping to achieve. Gently fold in the ingredients—Whipped egg whites can be a little finicky and it’s possible to knock the air out of them if you’re too rough with the macaron batter. Use a large spatula to gently mix everything together. Don’t skip the airing time—I know it seems odd to let the raw macarons sit on the countertop for an hour, but this is one step you absolutely cannot skip! The macarons will form a thin film on the outside and will dry out slightly, which is what makes them so perfectly chewy once they’re out of the oven. Cool completely before frosting—As with any frosted baked good, these cookies and cream macarons need to cool completely before you add the frosting in the middle. If you frost the macarons while they’re still warm, the frosting will run everywhere and your macarons won’t look as chic. Please let me know if you have any questions about how to make macarons. I know the process sounds scary, but I have faith in you! In a standing mixer using a whisk attachment (or mixing bowl with a hand mixer), whip the egg whites and salt on high speed for about 2 minutes, until soft peaks form. Add in granulated sugar and chocolate extract and continue to beat for 1 minute until very stiff peaks form. The egg whites should be foamy and firmly hold their shape. In a small blender, pulse your oreo cookies until they form a fine powder. 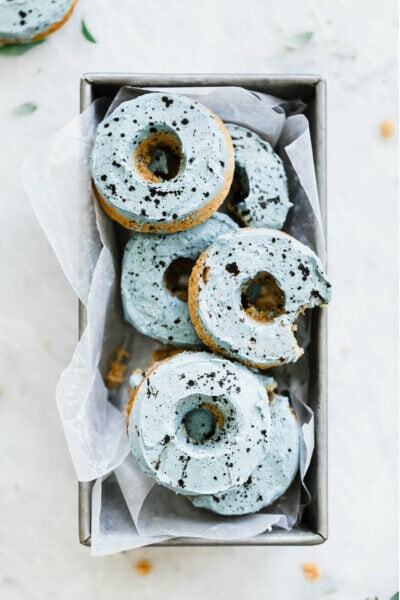 Using a fine mesh strainer, sift the almond flour, powdered sugar, and powdered oreos three into a medium bowl. Sift the mixture again two more times. You should be left with small almond granules each time you sift. Toss these out after each sifting. Fit a large pastry bag with a 1/2 inch tip and scoop your mixture into the bag. Pipe 1 1/4 inch circles onto 2-3 parchment-lined cookie sheets, leaving at least 1 1/4 inches between each macaron. The best way to make even circles is to pipe from directly above the macaron so your pastry tip is perpendicular to the cookie sheet. Squeeze the pastry bag from the top with one hand while using your other hand to steady the tip. Once you’ve piped your circle, swirl the pastry tip in a small spiral and lift upwards at the same time to finish your macaron. * Allow macarons to air out for at least 1 hour, and up to 2 hours. Now make your buttercream. Beat the butter with the oreo frosting and vanilla extract until light and fluffy, about 2 minutes. In a small blender, pulse your oreo cookies until they form a fine powder. Add in the crushed oreos, powdered sugar, and whole milk, beating again until light and fluffy, 1 minute more. Transfer to a small pastry bag fitted with a 1/2 inch tip. Once your macarons have cooled, frost and serve! Oh my, these look exquisite. I haven’t tried making macarons yet..maybe a little intimidated.. However, when I do decided to conquer the fear, I think this will be the perfect recipe to try! about how many cookies does it make and is the buttercream recipe enough frosting for all the cookies. Yes, it is enough! It makes about 30 macarons. Yummy! I have been terrified of making macarons but you have inspired me! Gonna have to try these! Pinned! Ooh these look incredible Sarah! 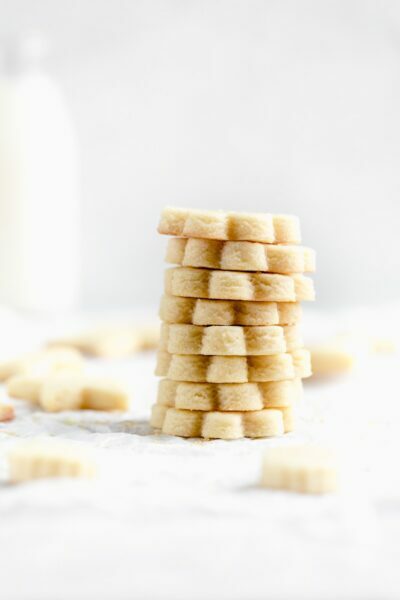 Loved seeing the sneak peak on instagram – and now I have the recipe so I can make them. These are so perfect!! What a flavour combination in macarons! These look FABULOUS! And yeah for being a Rodelle ambassador. That’s awesome! And I think you need to start doing videos on your blog, as I would like to see evidence of aforementioned happy dance. sarah, oh my god, these macarons came out perfect!! And the photos are beyond gorgeous!! I’ve tried making macarons twice and both times I failed. Funnily enough the time I made it without a scale came out much better than with the scale. I have to try your recipe because the one I’m using just ain’t working out for me. Pinning this everywhere! I’m making these right now and so far they are absolutely amazing!!! Thanks Sarah!!!! Congrats, you nailed it… these look amazingly good:) Macarons are my favourite! You are well on your way to making your dreams come true, Sarah! Your blog and your recipes are amazing! Congrats on becoming a Rodelle Ambassador! These macarons sound out of this world delicious. WooT WooT Sarah ! High fives on Rodelle! So excited for you and for Rodelle, a fabulous company to represent for sure! And your delectable, delicious, perfectly formed feet and smooth topped macarons look like they were made at a pastry shop! My favorite shot is the short stack with one propped on the side…. love seeing the top of that beauty. Well done, and congratulations my dear! I’m in awe…these are amazing. I love the photos and I love Rodelle — congratulations! 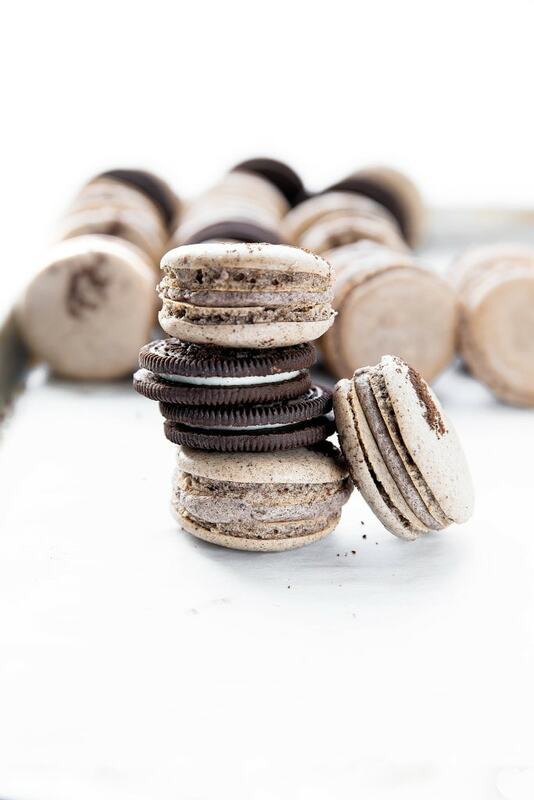 My husband calls macarons “sugar burgers” and loves them… almost as much as he loves the cookies and cream combo. I’m going to have to give these a try soon for him (oh and who am I kidding, for me, too)! Are you serious? I am so in love with this! Well, first of all these are GORGEOUS. Just gorgeous. Second, this little baker is a tad intimidated by macarons also. She has never even tried. BUT – I think I will. These just look too good! And bravo to you for persevering through your macaron trials!! I’m floored. As in… there’s a puddle of drool on the floor because my mouth has been wide open in shock for the past five minutes. No really, I even called somebody to talk about these. You’re tempting me SO HARD right now. I made these and they’re beautiful! Perfect! And your directions were spot on. Thank you so much!! I’m not sure if I’m reading the instructions correctly but I don’t see where to add the chocolate extract. I’m taking it that you add it to the whipped eggs? Hi Natacha! You’re so right- I accidentally left that part out! I’ve updated the recipe to include adding in the extract in Step 1. Thank you for commenting and happy baking! You’re going to LOVE the macarons! Hello!l really lovely recipe! May I know how many g is a cup? Hi Haruka! How many grams in a cup varies depending on the ingredient. You can find gram to cup conversions online if you also include the name of the ingredient in your search! These look delicious, if you have any other macaron recipes on your blog, please feel free to add them to my Pinterest groupboard https://www.pinterest.com/patisseriemp/macarons/. Send me a message if you’d like to be added as a pinner. I’m trying to make the macarons and was wondering what I can use instead of Chocolate extract? Hi Lilly! You can simply omit the chocolate extract. It’s a flavor enhancer, but without it the macarons will still taste great! Thank you so much, Isabel! So so glad you enjoyed them. They’re some of my faves too!! Hey I’m in the midst of baking these and so far so good! But do I use 4 cookies worth of icing or the total 8? Cause for the cookie part it said to leave the icing aside but I don’t know what for! Hi Jules! So you’ll use 8 cookies of icing total! I’ll update the directions now to make that more clear. These look amazing! I’d love to make them for christmas. Do you know how long they stay fresh for once they’re made? I made these and they were delicious! Thank you! just made these 🙂 first time making any kind of macaron and they turned out great. I subbed the chocolate extract for vanilla because i couldn’t find chocolate and it tastes great. I made it and it was amazing tasting Macaroons the world ?? OMG! These look amazing! Love this! I just came across this post via the Rodelle website… Oh my word, these macarons are absolutely gorgeous! I just wanted to say I made these today, having never attempted macarons before, and they turned out SO GOOD. Beyond words. Thank you so much for sharing this recipe, I could not be happier right now. So so glad to hear that! Thank you Jacquline! excellent recipe ! I tray to make macarons so many times and they where always a disaster. Then I found this recipe, and they look delicious and beautiful so I decide to do it. The result is incredible, they taste and look delicious ! Hi how should these be stored if I make a day or two ahead? Hi Grace! I would make the macaron cookies and salted caramel ahead of time, but wait to sandwich them together until the day of! Store the cookies in a sealed container and the caramel in a jar in the fridge. EnjoY! This was my first time making macarons. Followed this recipe exactly and they turned out great! Love it! My daughters and i had a macaron afternoon and we settled on this recipe as our base. From it we tried different flavours and had great success!!! Thanks so much. we are inspired to do more of these in the future. That sounds amazing! So glad you enjoyed, Tammy! Hi! Ive never made macarons before but I’ve always wanted to try. I don’t know how important almond flour is but I was wondering if you could substitute almond flour for something more normal lol? I have nut allergies and i can’t seem to find a recipe that doesn’t use almond flour. I read somewhere that you can increase the amount of eggs you use with all-purpose but I’m not sure how much more to add? Thanks! Hi Kelly! As far as my baking knowledge goes, almond flour is a total necessity in making macarons. Total bummer! 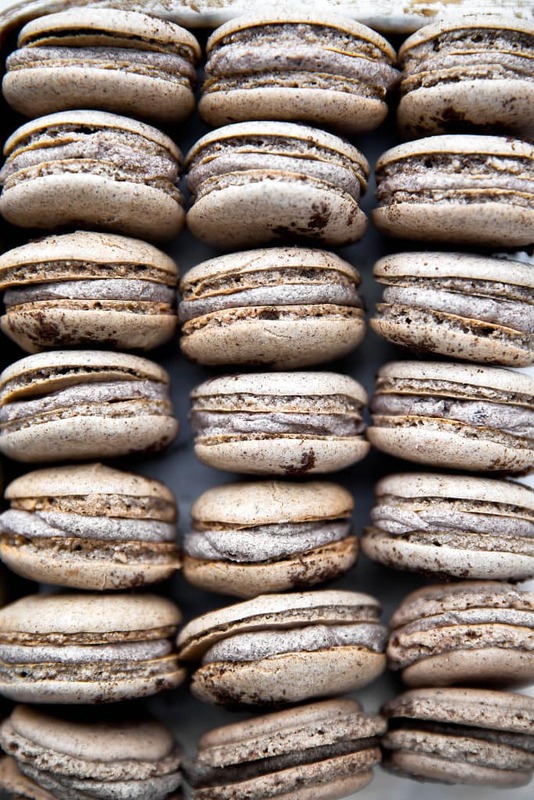 You could try making a cookies and cream meringue, but for a true macaron, almond flour is necessary. Last weekend I set out to make macarons for the first time. I have never been much of a baker but I thought, if I can master these, I can master anything. I started with this recipe and they turned out absolutely perfect!!! This weekend I tried a couple other recipes from another site and they didn’t turn out at all. So I tried these again to see if I had just lost my touch or if it was the recipe. Once again, perfection. They have been such a huge hit! Thank you so much and I will be trying more of your recipes! I want to try these but i cannot find chocolate extract anywhere. Is there a substitute? Perhaps using cocoa powder? Thinking about making these using your swiss meringue method. Have you tried? Any suggestions? Haven’t tried with these but it would make them more stable. I’d do it!